Disposable half face protective Respirator with Exhalation Valve and Activated Carbon. Pocket sized, light and comfortable, ideal solution both for workers and those who travel by bicycle. Flat Fold Mask with Activated Carbon and Exhalation Valve are innovative disposable half face protective Respirator, a personal protective equipment (PPE) effective in respiratory protection of the worker exposed to dusts, fumes, mists (potential irritants of throat and upper respiratory tract). These Protective Masks allow the worker to work safely, avoiding to breathe, together with the air, all that is mixed to it, in the form of steam, of microscopic liquid particles (aerosols) or solid micro-particles (fumes and dust). Furthermore, the Exhalation Valve facilitates breathing, ensuring maximum comfort and protection, while the activated carbons help in deterring unpleasant odors. The internal nose clip is placed between two layers of fabric in order to reduce as much as possible the aluminum / metal parts of the PPE and to avoid possible contamination of the product (as required by some pharmaceutical and food industries). Foldable, pocket sized and single packed in plastic envelope, Flat Fold Masks offer greater comfort and improved hygiene for the user, and are ready to use in just one move, thanks to the welded elastic bands. 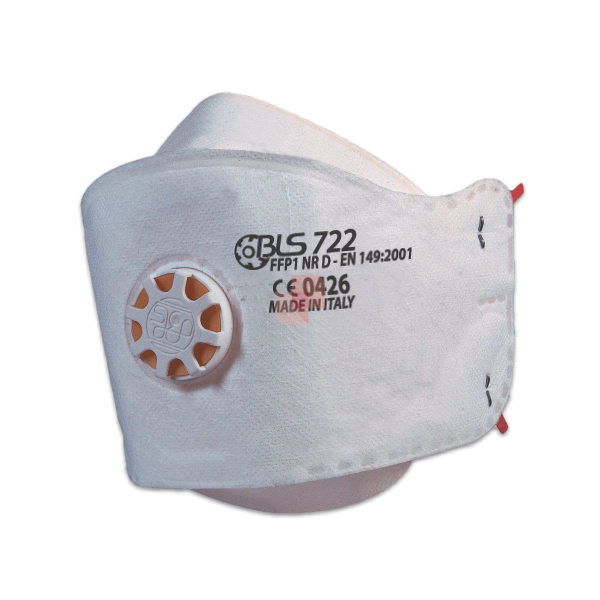 The Flat Fold Respirator Mask with exhalation valve and activated carbon is available with Protection Factor FFP2: against aerosol solid and / or liquid indicated as hazardous or irritating. For reasons of respiratory comfort, style and convenience of transportation, the flat mask with activated carbon is the product most used by those who travel by bicycle in the city.